Today we are continuing our journey back through the first 10 years of Papertrey Ink with a look back at 2010. That year brought several new stamp sets including one called "Year of Flowers" and featured the different flowers for each of the months of the year. I have only one of the larger version, Lily of the Valley. Lily of the Valley are special in my family. 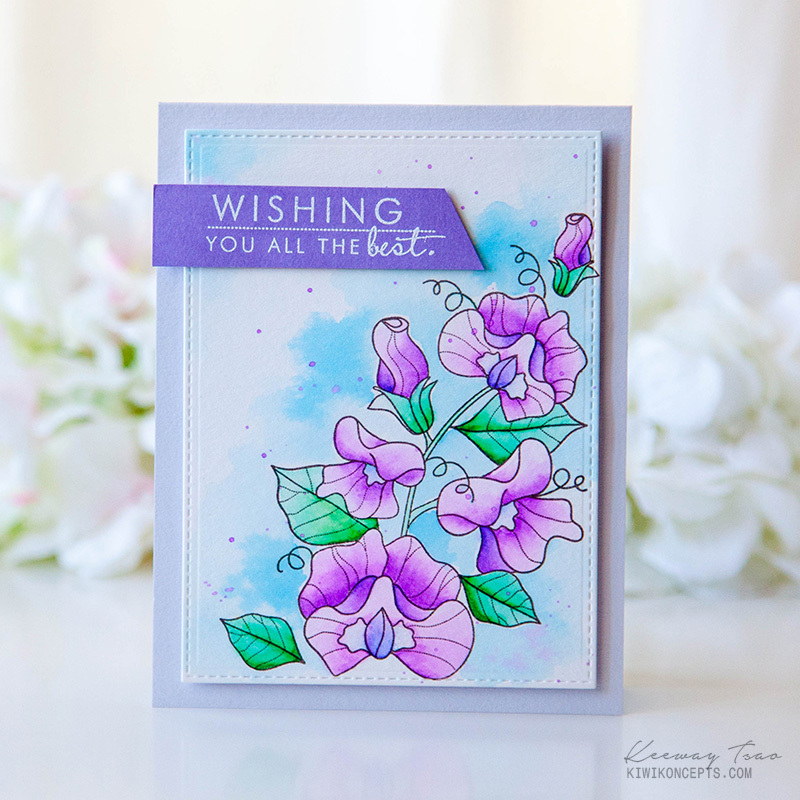 However, after seeing all the gorgeous projects that Nichole posted and seeing Keeway's watercolor, I know the Sweet Pea will be my next set. I also really want the Daffodil, and the Rose and ....well - you know. Probably all of them eventually. I started by stamping the image in Versamark onto a piece of Canson Bristol Watercolor Paper and heat set it using Antique Gold Embossing Powder. I grabbed a few distress markers and my water brush and took it on a clip board to color in front of the TV. I feel like I don't get to watch much TV but the clipboard gives me a strong flat surface to work on if I want to do something while I'm "watching" which should probably be more accurately described as listening. Anyway, this is my absolute favorite way to watercolor. While I have other mediums, I find this one to be easiest for what I do. And I even prefer it over my Zigs. I used a combination of Mowed Lawn and Pine Needles to color the leaves but for the white blooms I put down just the tiniest amount of Weathered Wood and pulled it out with my Wink of Stella Clear Glitter Brush Pen. Once that was dry, I went all around the image with a small amount of Tumbled Glass and slightly more water and let it pool a bit here and there to give it a few hard edges in an otherwise soft blue "sky". To create the card, I die cut the watercolor panel then die cut another larger panel from Aqua Mist Cardstock. I put a piece of fun foam under the watercolor panel to give it some dimension. That was attached to a Card Base made from Stamper's Select White Cardstock. Then I stamped the sentiment on a scrap piece of Aqua Mist, heat embossing it then cut it into a banner to attach to my card front. The fun foam behind the main panel helps it to go through the mail without getting torn up. I added a few metallic aqua sequins as the final touch. While I love Keeway's beautifully colored image, that wouldn't have suited my image well at all. Thanks again for stopping by to see my card and I hope you'll come back again. Be sure to pop over to Papertrey Ink's Blog to see all of the projects for today! Your card is so beautiful with the simple subtle color variation in your deep green leaves, and the hints of color in sky and flowers. Love it! I remember selling you that set, which was the best thing I ever did. You've done a much better job of using it than I ever could! So beautiful, it looks real! They bring back such fond memories from my childhood. My grandmother mother had these planted around the entire perimeter of her house when I was a little and I loved to pick them, lol. Thanks for sharing and inspiring.